Create a work of “heart” and send it to a loved one today! 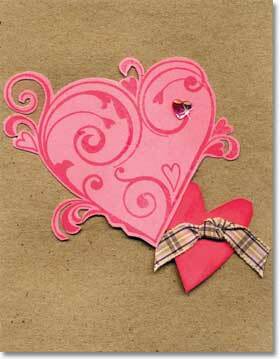 Stamp the Fancy Heart image in pink ink on a Pink Notecard. Cut out. Free hand cut the heart out of a Peony Notecard. Ink the edges. Mount onto a Kraft Notecard with foam tape. Add a heart from the Spring Mixed Gemstones and a bow. Cut around the tight areas of the heart with a craft knife.